The Silk Road connected many civilisations across Asia. 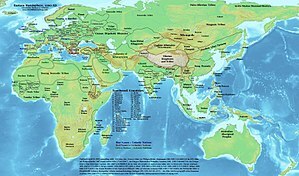 The history of Asia can be seen as the history of several distinct regions, East Asia, South Asia, and the Middle East that have more or less context depending of the situation in the central Eurasian steppe. The coastal periphery was the home to some of the world's earliest known civilizations, with each of the three regions developing early civilizations around fertile river valleys. The civilizations in Mesopotamia, the Indus Valley, and China had much in common. Therefore it is likely that they exchanged technologies and ideas such as mathematics and the wheel. Other aspects such as that of writing developed individually in each area. Cities, states and then empires developed in these lowlands. The steppe region had long been inhabited by nomads, and from the central steppes they could reach all areas of the Asian continent. The earliest known expansion out of the steppe is that of the Indo-Europeans which spread their languages into the Middle East, India, and in the Tocharians to the borders of China. The northern part of the continent was not accessible to the steppe nomads due to the dense forests and the tundra. These areas had very few people. The centre and periphery were kept separate by mountains and deserts. The Caucasus, Himalaya, Karakum Desert, and Gobi Desert formed barriers that the steppe horsemen could only cross with difficulty. The city dwellers were more advanced in civilisation but they could do little militarily to defend against the mounted hordes of the steppe. Because the lowlands did not have enough open grasslands to support a large horsebound force the nomads who conquered states in China, India, and the Middle East were soon forced to adapt to the local societies. Alexander the Great conquered an area from Turkey to India in the 4th century BC. The Roman Empire would later control parts of western Asia. The Achaemenid, Seleucid, Parthian and Sassanian empires were based in Ancient Persia. Many ancient civilizations were influenced by the Silk Road, which connected China, India, the Middle East and Europe. The religions of Hinduism and Buddhism, which began in India, were an important influence on South and East Asia. The Islamic caliphate and other Islamic states took over the Middle East starting in the 7th century, and later expanded into India and Indonesia. The Crusades would be fought from the 12th century, in Christian Europe's attempt to retake the Holy Land from the Muslims. The Mongol Empire conquered a large part of Asia in the 13th century, an area extending from China to Europe. The Russian Empire began to expand into Asia from the 17th century, eventually taking control of all of Siberia and most of Central Asia by the end of the 19th century. The Ottoman Empire controlled Turkey and the Middle East from the 16th century onwards. In the 17th century, the Manchu conquered China and established the Qing Dynasty, although this was in decline by the nineteenth century and had been overthrown in 1912. Several European powers had control of other parts of Asia by the 1900s, such as British India, French Indochina and Portuguese Macau and Goa. Russia and Britain struggled for power in the Central Asian region in the nineteenth century. The Trans-Siberian Railway that crossed Asia by train was complete by 1916. Parts of Asia remained free from European control, although not influence, such as Persia, Thailand and most of China. In the twentieth century, Imperial Japan expanded into China, Korea and Southeast Asia during the Second World War. After the war, many Asian countries became independent from European powers. During the Cold War, the northern parts of Asia were communist controlled with the Soviet Union and People's Republic of China, while western allies formed pacts such as CENTO and SEATO. Conflicts such as the Korean War, Vietnam War and Soviet invasion of Afghanistan were fought between communists and anti-communists. In the decades after the Second World War, a massive restructuring plan drove Japan to become the world's second-largest economy, a phenomenon known as the Japanese post-war economic miracle. The Arab-Israeli conflict has dominated much of the recent history of the Middle East. After the Soviet Union's collapse in 1991, there were many new independent nations in Central Asia. This page was last changed on 29 March 2019, at 15:28.